Robyn and Chris’ downtown St. Pete destination wedding featured DIY elements to show their gratitude to their wedding guests. The destination couple incorporated vintage elements from their families into their big day. While Robyn and Chris are both from Florida, they were living in Charlotte, North Carolina while planning their downtown St. Pete destination wedding. “I was born and raised in St. Petersburg and always wanted to get married in my hometown. Over the course of our relationship it become a home away from home for Chris too and wasn’t too far from his family in Cape Coral. 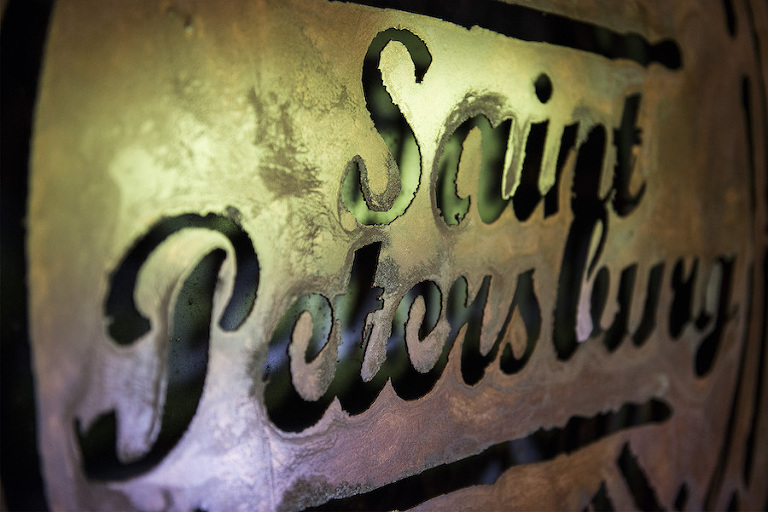 The pair searched for a St. Pete wedding venue that was timeless and classic and allowed them to hold their ceremony and reception in one place. “NOVA 535 was perfect. It had so much character; the bamboo courtyard where we had the ceremony was like nothing I have ever seen. The brick, dual staircase, upstairs balcony and of course their famous restrooms, all were unique open spaces which really allowed us to add our style and soften the lighting for that rustic, vintage feel,” the bride gushed. Looking back, one of Robyn’s most memorable moments was celebrating with her new husband at the end of their ceremony. 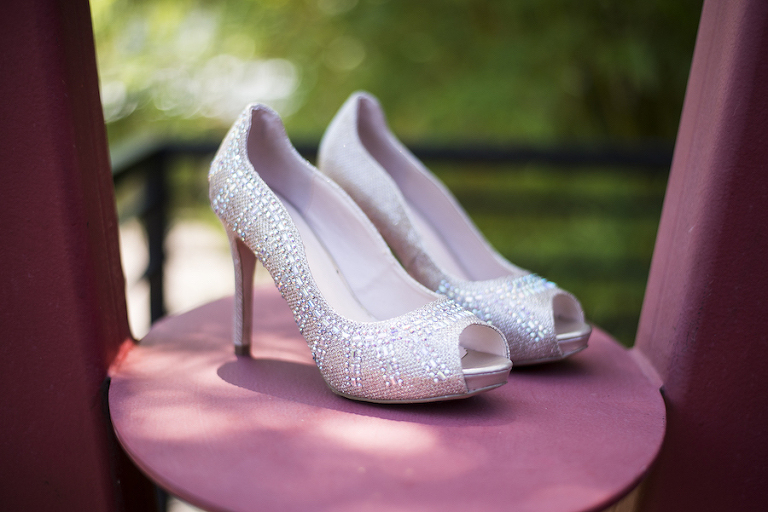 “The best moment was stepping on the glass, raising our hands like champions, knowing we made it this far!” the bride reminisced. Chris and I met in Tallahassee while I was in my junior year at Florida State University. While working at the DoubleTree Hotel, we were the cliché of the chef and the waitress. We experienced so much over the 11 years we had been together, sharing through 5 cities with our 2 dogs. Chris and I woke up one average morning in the summer in between travel for his work. He asked me the night before, while I was half asleep, what my schedule was the next day, and I mistakenly answered with “I’m off.’ which was not accurate. Although, Chris thought it meant it was the perfect day. Long story short, I woke up to a gorgeous ring in my face and him on one knee next to the bed. I wasn’t actually off, but I had a pretty amazing day at work! Rustic chic with a touch of vintage. There was so much I loved and was inspired by, and I just had to encompass every bit of what I loved. Rose pink, mint, celadon and champagne. I wanted soft and classic colors in the flowers and the dresses, with a nice contrast. We knew we needed a place for ceremony and reception in one and both loved that barn wedding look, but wanted to be sure it was us and timeless and classic. 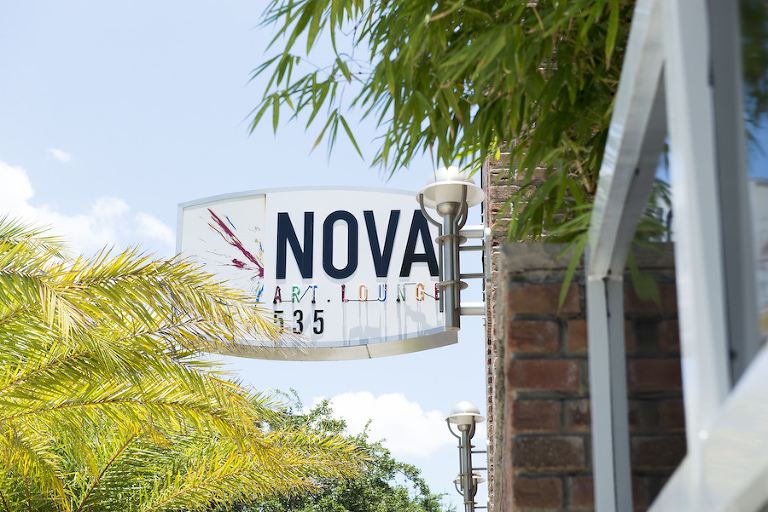 Ultimately it was a place that was a blank canvas in a way that helped bring our vision to life, and NOVA 535 was perfect. 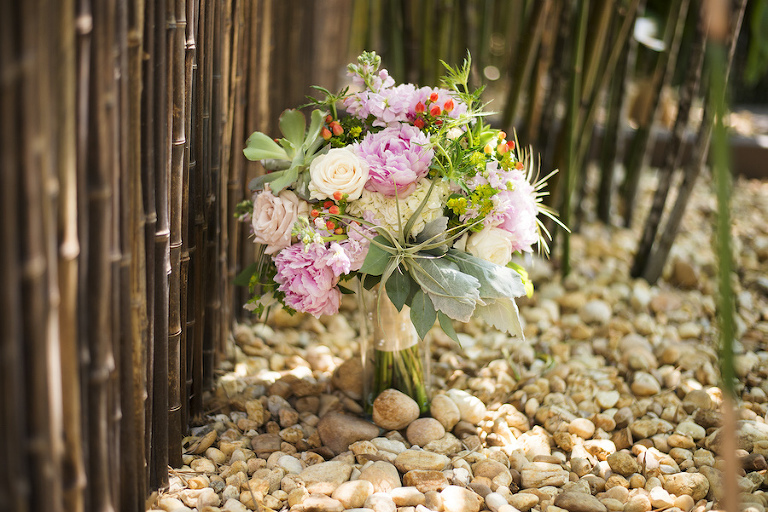 It had so much character; the bamboo courtyard where we had the ceremony was like nothing I have ever seen. The brick, dual staircase, upstairs balcony and of course their famous restrooms, all were unique open spaces which really allowed us to add our style and soften the lighting for that rustic, vintage feel. Working with a bride and groom who lived out of state, I am sure wasn’t easy, but Michael and his team there at NOVA really have a good thing going. Everyone said it to me, but it rings true, stay true to what you and your future husband want. It’s your day. Enjoy it!